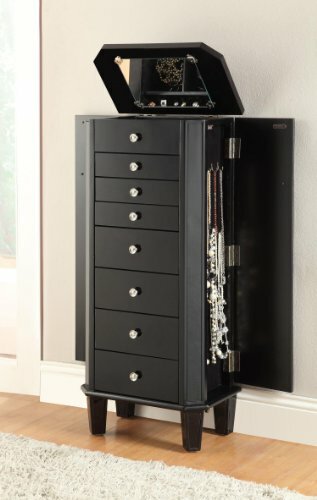 This modern jewelry armoire features an overwhelming amount of storage for your every jewelry and accessory need. Seven front drawers are perfect for holding bracelets, accessories, cosmetics, and other small items. The flip-top contains a felt-lined compartment in a light mocha color for safeguarding precious pieces. The built-in mirror lets you double-check your accessories or make-up before you head out for the day, while side doors contain hooks for neatly hanging necklaces. Available in Black and Antique Silver/Mirrored finishes.